Occurring in early 2016 within Brian Ritchie’s MONA FOMA music festival, Aesop’s Chamber of Light & Shadow offered revellers a combination of discretion and potency; a quiet spot amongst the stages to further engage the senses. Nestled adjacent to the Mona museum building entry and set behind a small grove of trees, the project creates a route and memorable place, an experience, barely apparent within the landscape as an object. 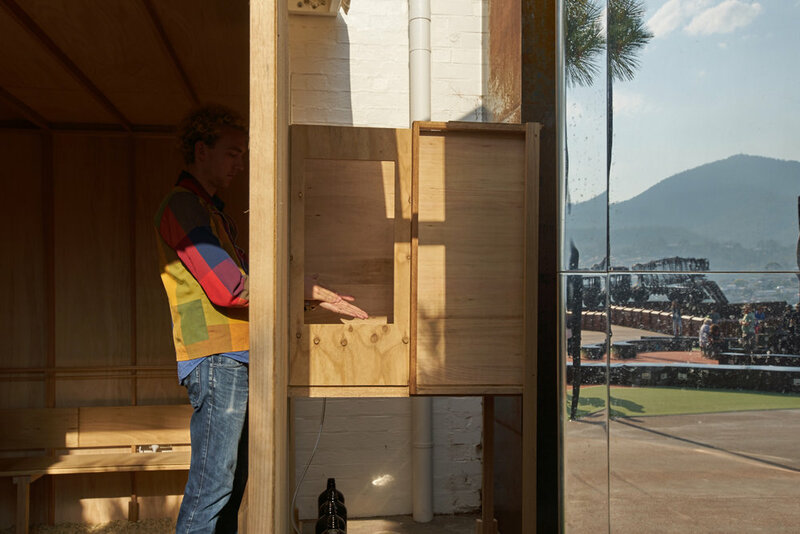 Within the Chamber, a leisurely exploration of Aesop’s skin care range is offered in conjunction with ambience and selected views outwards from the enclosure. Memorably, at the moment of encountering the balms, the configuration entails reaching with one’s hands into the light.